Ledderhose disease, a medical condition in which you develop lumps on the soles of your feet, can make it difficult for you to get around. And, when you are on your feet, you'll commonly experience a significant degree of pain due to the pressure of your body weight pushing on these lumps. There are several medical strategies that you and your doctor or a specialist can discuss, including injections to manage your pain and even surgery to remove these bumps. If you're experiencing a considerable amount of pain when you're out and about, you might feel compelled to stay at home — but you may then feel frustrated with being stuck in your house. Here are three assistive devices that you can rent or buy to help get around. Crutches are a simple device that can be effective for keeping your pain at bay when you have Ledderhose disease. Crutches are most effective if you have the lumps only in one foot. If this is the case, you can keep this foot elevated just a handful of inches off the ground and get around with the help of your crutches. Although using crutches requires a bit of physical exertion, you should be able to build up to their use and be able to comfortably get around. A knee walker, which is a four-wheeled device with a pad to support your leg and knee, is something that people will commonly during the recovery process of a broken leg or ankle. However, this assistive device can also be useful if you're dealing with the painful symptoms of Ledderhose disease. Again, this device is best if you have the lumps in just one foot. 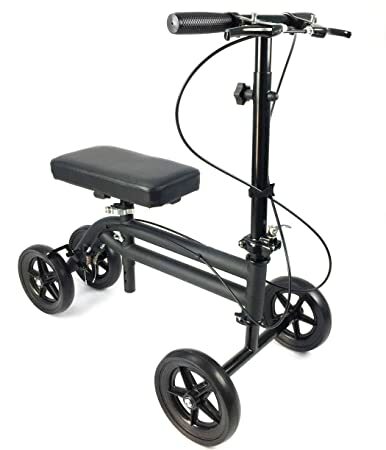 By elevating that foot and placing your knee and shin on the soft pad of the knee walker, as well as hanging onto the handlebars for support and stability, you'll be able to get around without foot pain. A traditional walker can also be useful to consider, based on the severity of your symptoms. If you're in an early stage of Ledderhose disease in which you can walk with only light pain, but you want to be able to sit frequently, a walker is ideal. Leaning onto the handles of the walker allows you to reduce some of the pressure on your feet, and whenever you need a brief rest, you can sit on the seat of this device. For more information, contact a group like Dupuytren's Disease Support Group.